A food dehydrator is not a piece of kitchen equipment that every household needs, but it is one that can do things no other appliance does. A food dehydrator dries out a wide variety of foods – from fruits to herbs to beef jerky – by exposing them to low but warm airflow for an extended period of time. I’ve been using my Hamilton Beach Digital Food Dehydrator for several months now and figured it was time to deliver some feedback on how it is working out! 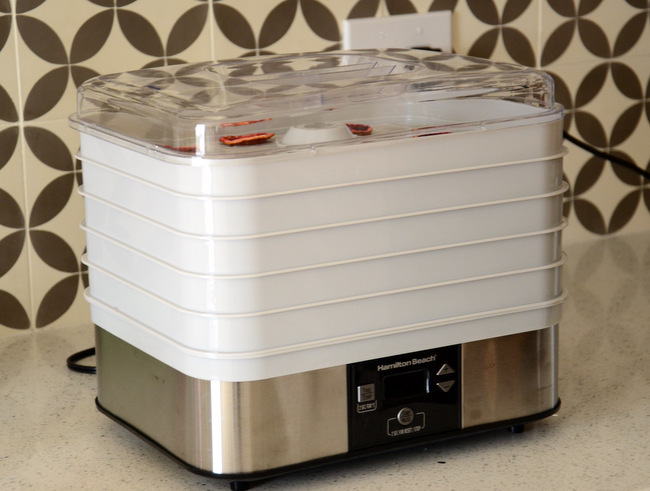 There are a lot of food dehydrators out there and I opted for the Hamilton Beach for a couple of reasons. This model (32100A) comes in at a reasonable price point and has five stacable drying trays that allow for a considerable amount of drying to take place at one time. It also includes a fine mesh sheet for drying extra small foods – they recommend herbs but I’ve used it to make muesli – and a solid sheet to make fruit leathers/fruit rolls with. It takes up a little more counterspace than a coffee maker, but it is very lightweight and easy to store out of the kitchen when it is not in use. The controls of the dehydrator are easy to use. The temperature is adjustable from 100 – 160F, depending on what you are drying. And if you’re new to dehydrating, the instruction manual is very comprehensive when it comes to drying charts for almost everything you could put in there – and you can use their instructions as a guide when you’re ready to venture off on your own. It also comes with a number of recipes for beef jerky, which is probably the dried food item that requires the most instruction on how to do it properly. One thing to note is that dehydrating is a long, slow process – and that is exactly why you might want to use a food dehydrator instead of your oven. Depending on what you’re drying, you might need to run the machine for anywhere from 4 – 13 hours (or more, if your fruit is very juicy to start). The machine is a bit on the noisy side, but I try to run it overnight or when I’m not going to be sitting in the kitchen all day (quieter than a hairdryer, but louder than a microwave). If I’m home, I’ll treat the sound like white noise and tune it out after a bit – or simply turn up the tv a few notches. 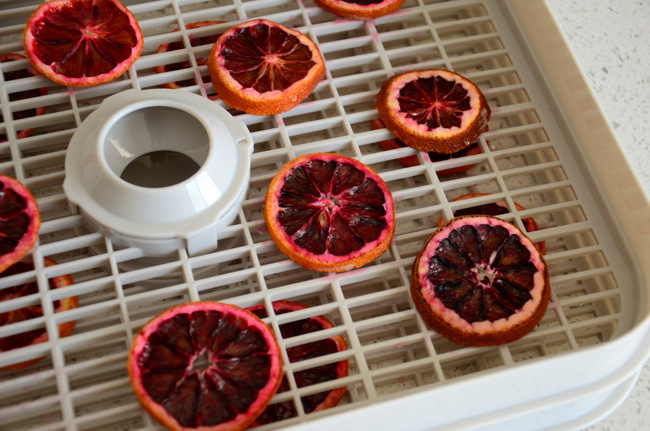 The trays are all dishwasher safe, so cleanup is easy when you’re done dehydrating. All in all, it’s a great gadget to have if you have room for it. It allows you to make easy, healthy snacks that you can’t make any other way. I love it for making garnishes and drying herbs, too.